Lighting is often the last thing you think about when you are building or doing some renovations. But when your project is finished, the light will be one of the most important aspects of your interior and exterior decoration. However it is not easy to make a choice in terms of lighting because of the market wealth. The personal taste remain an important factor in the decision but it is also important to take into account some advice to correctly illuminate a room by creating the desired atmosphere. 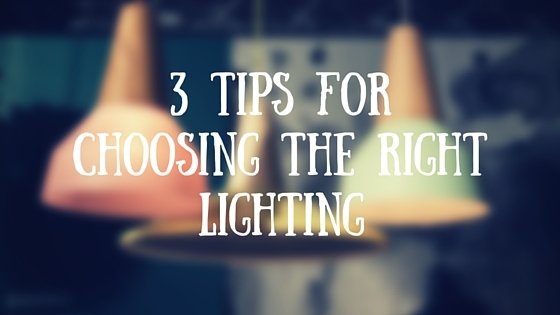 That’s why we want to share these 3 tips that you should keep in mind when browsing through our selection of designer lamps. The main lighting must provide a sufficient comfort in terms of amount of light. The amount that is needed depends a lot on the room function (kitchen, living room…). The main lighting can be ensured by embedded spotlights, rails of spots, or by a central pendant light. Indirect lighting has as primary function to create a bright atmosphere. The goal is to have an inspiring and warm lighting. This is achieved by placing wall lamps (find some great choices from brands like Tom Raffield), floor lights or table lamps. Little trick; if you place such lights in the corner of a room, it will enlarge it. Emphasis or task lighting will aim to highlight an object or a room feature. Like a painting on the wall, a decorative object on a piece of furniture, etc. This is the typical lighting used in museums and galleries. Such lighting is realised thanks to a directional spot with a narrow beam of light. Task lighting, such as desk lamps and LED strips, is needed when you carry out an activity. This means the light quantity radiated from a light source in all directions of a space. (On every bulb box you can find the number of Lumen). This means the amount of light flow by surface (expressed in Lumen / m²). You should also know that this is a pretty subjective concept. Some people will be satisfied with 80 Lux while for other people 300 Lux will be ideal. Also, the type and quality of the light affects the perception of the lighting level. A light bulb in natural light with excellent color rendering will give a stronger feeling of light for the same lumen. Finally the color of the walls, furniture, the shape of the room will also have a significant impact on the feeling of lighting. You take the room surface that has to be illuminated and the desired number of Lux, you’ll get the number of lumens needed. Finally, knowing the lumen of each light source, you can easily estimate the number of light points (spots, pendants, floorlamps, wall lamps, task lamps, …) to be installed in the room. When choosing your ideal lamp online, you also have the choice between 3 bulb technologies: Halogen, CFL (energy saving lamps) and LED bulbs. In terms of power consumption, it is clear that LEDs are the most efficient, followed shortly by the Compact fluorescent (CFL). A LED bulb with the same light output and Watt as an halogen bulb, can be up to 5 times lower in terms of consumption. However we must also take into account two other characteristics of light in choosing your bulbs. This is being expressed in Kelvin (See below the scale of color temperatures). IIn private houses, we recommend 2700 Kelvin. which is the temperature of an halogen bulb. This is the warm color that we are used to have in our home. If you want a more cozy atmosphere, and a warmer color, we can now find LED bulbs with a color temperature of 2200 Kelvin. If you want to read more about color temperature, you can find interesting articles about this subject on the website of seesmartled. These are certainly the most important features for our eyes. This is what will set the quality of the emitted light. In the case of Eco-Halogen bulbs you have a CRI of 100%, which is not the case with Compact Fluorescent or LED bulbs. With an incandescent bulb, the heat is transformed in light. This means that the spectral characteristics of the emitted light are the same as from the sun. LED bulbs can easily imitate the temperatures of warm colors, but the objects and colors can appear colder and less intense as it can be a big difference in the characteristics of the light spectrum between some LED bulbs and eco-Halogen bulbs. Today some LED bulbs technologies are able to develop a light with a light spectrum and a color rendering perfect with CRI of 99%, such as SORAA bulbs. However, most commercially available light bulbs currently do not offer such a clear color rendering quality as Halogen or SORAA. Last note on LED bulbs: it has several factors that can influence the price of a bulb against another. Mainly if a LED bulb is more expensive than another, it is because the components are not all the same quality and therefore the longevity and quality of the emitted light will not be the same. One of our next blog posts will be specifically about LEDs. So be sure to sign up for our newsletter just down this page, so you don’t miss any updates of our blog!